Anilox Roll Cleaning Systems (ARCS) specializes in cleaning all types of printing and coating rolls with two cleaning methods – one using specially formulated Sodium Bicarbonate (aka Baking Soda) and the other with a laser beam. The Baking Soda we use is a proven, proprietary formula developed by Arm and Hammer that allows for superior yet gentle cleaning, a dust-free application, and is environmentally-friendly. The laser cleaning method uses a low intensity light beam and only requires electricity to work – no consumables are ever needed. We also carry a great line of ink, adhesive and coating removers that are non-hazardous and safe for both the user and the environment. We are very good at allowing companies to continue their operation with minimal downtime – we can clean rolls ON-PRESS (nobody else offers this level of service). We can also clean rolls OFF-PRESS, either at your facility or ours. Many clients ship their rolls to our Pennsylvania facility. We can have a roll cleaned and, under most circumstances, on its way back to our clients within 24 – 48 hours. Same day service can also be arranged. Our company was founded on customer satisfaction. We have stayed in business for over 20 years because we help our clients when they need us, day in and day out. We understand your business, and how unpredictable it can be. Please call us if you have any roll problems at all. Chances are we can help! ARCS understands the desire and need for sustainability and values both our client’s and our earth’s resources. In 2015, ARCS began offering laser cleaning – an easy-to-use cleaning technology that only requires electricity to work – no compressed air, water, or media are ever needed. We have many long-time clients who have relied on us since our inception. We work with all different sized companies – some with just a few rolls and others with dozens of rolls. They continue to use our service because it works and is very affordable when compared to resurfacing or replacing a roll. As an approved and certified A-Rated contractor with ISNetworld, you can trust ARCS to take care of your roll cleaning needs in the safest manner possible. ARCS pioneered anilox roll cleaning using baking soda over 20 years ago and was instrumental in the design and technology involved in creating the roll cleaning systems that we use and sell today. Since then, we have successfully cleaned well over 20,000 rolls. 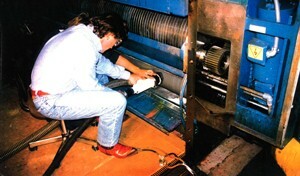 Our service technicians have over 50+ years combined experience cleaning printing rolls. Our deep cleaning method is superior to others, and will restore a roll to “like-new” condition. In fact, we usually hear “wow” when someone witnesses for the first time the cleaning power of Baking Soda.